I have a love-hate relationship with this topic. Hate: This comes with the women and men that obviously should not be trying to look "fierce" (as They say animal print helps with) at inappropriate places and times. My disapproval doesn't stem from their age. Age is just a number. ...as is the number of children you are responsible, the number of people that report to you in a professional setting, and the number of police cars stooped up on the block you're walking down. Your ferociousness will not help you when it comes in a skin-tight form and these numbers are high. 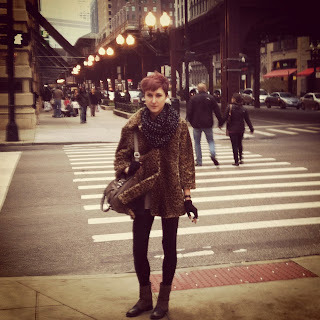 Strolling down the most aestheticly pleasing street in Chicago(Wabash), her two-toned shoes and p(hopefully)leather pants were the perfect match for mountain of wilderness she wrapped around her. There isn't a more appropriate time or place to pile on the fierceness than a windy, Saturday afternoon in the Midwest with not too much to do.